Quarter and core the apples then slice into wedges, about four per quarter. Mix in a bowl with half the lemon juice. Slice the celery on an angle and add to the apples. Halve the grapes and add them too. Toast the walnuts on a baking sheet in a moderate oven (about 175C) until slightly browned and fragrant, about 10 minutes. Check often as they will go from raw to burnt in a matter of minutes. Leave them whole or crumble into chunky pieces, as you prefer. Make some mayonnaise by whisking the egg yolk, mustard, a tablespoon of the remaining lemon juice and a pinch of salt in a bowl. Continue whisking while slowly drizzling in the oils until all have been incorporated. Make sure you keep the mixture emulsified. Loosen it with a little water until the consistency of salad cream, taste and season with more salt and pepper, lemon juice and mustard if needed. It should be fairly tangy. Wash and dry the watercress and remove any large stems. Pick the leaves off the parsley and lovage and snip the chives if using. Crumble the Stilton. When you are ready to serve, dress the apples, celery and grapes with enough mayonnaise to liberally coat. 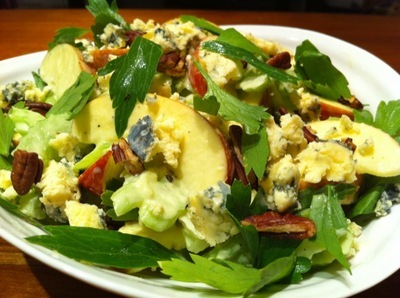 Assemble by layering the dressed apple mix with the leaves, toasted nuts and crumbled Stilton.